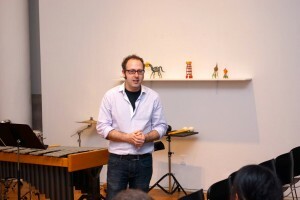 Noam Faingold writes concert music influenced by rock music, and vice versa. He is currently the composer/singer for the Burning City Orchestra, and director of Tulsa’s college preparatory music institution, the Barthelmes Conservatory, at the bART Center for Music. Noam created and runs the composition programs at the bART and at Tulsa Community College, where he also directs the new music ensemble. He also teaches History of Film Music at The University of Tulsa. Noam received his PhD in composition from King’s College London with a Jack Kent Cooke Graduate Fellowship in March 2015.